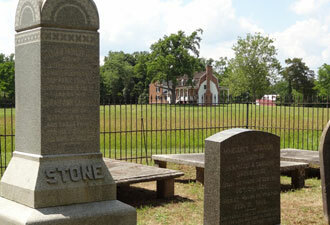 Known as a peace-loving man, Thomas Stone lived in the small, mostly rural area of southern Maryland for most of his life. Yet, when the decade-long turmoil between Great Britain and the 13 American colonies erupted into armed conflict in 1775, Stone set aside his comfortable existence as a country lawyer to serve the fledgling nation as a member of the Continental Congress. In 1776, Thomas Stone found himself as one of the 56 men who affixed their signatures to a document that changed the history of the world – the Declaration of Independence. 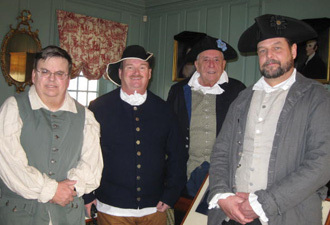 At Thomas Stone National Historic Site, you can learn about the life of this little-known patriot and discover how a man who was moderate in his personal beliefs, risked everything he held dear — family, land, and status — to sign a document that could have meant death if the outcome of the Revolutionary War had been different. On the 322-acre estate you'll hear about Stone's love for this land and the surrounding area. The most significant building is his house, Haberdeventure. The central feature of the five-part Georgian style home is set apart from its two wings by two hyphens, or connecting architectural links. The name, Haberdeventure, derived from Latin and meaning a dwelling place in the winds, fits the home well as it sits on top of a small plateau. Just a few hundred yards south, the land falls off into the Port Tobacco River valley. Other historic structures dotting the landscape include stables, corn crib, tobacco barn, and a tenant house. A small cemetery, where burials took place into the early 20th century, contains the gravesites of Thomas, his wife Margaret, and several descendents of the Stone family. As Thomas Stone lay dying in the autumn of 1787, he wrote a farewell letter to his son, Frederick. In it, Stone admonished his son, “Let your aim in life be to attain the goodness, rather than greatness among men. The former is solid, the latter all vanity, and often leads to ruin.” These words apply perfectly to the life led by Thomas Stone. Five miles west of the town of La Plata in Charles County, the park is open year round, Wednesdays through Sundays from 9 am to 5 pm. Special events occur throughout the year. 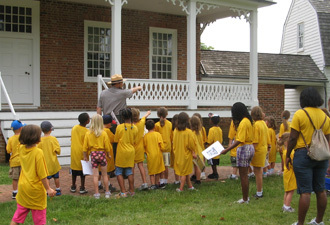 The two most popular events, the 4th of July and the Christmas candlelight tour, bring hundreds of visitors to the site. Visit the park online to keep up with news and special events.